DOES YOUR FAVOURITE PAIR OF SHOES OR BOOTS NEED DESPERATE REPAIR? 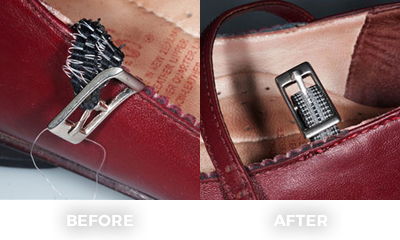 Hurry Up Shoe Repairs can give your old faithful shoes the TLC they deserve. Whether your Italian dress shoes need a heel replacement or your designer high heels need a new buckle, our team of expertly trained cobblers can save the day. No need to waste money on new loafers, or give up on the years it's taken for those cowboy boots to perfectly mould to your feet. Call Hurry Up Shoe Repairs for your shoe restoration estimate now, your beloved boots haven't taken their last step yet! From a simple heel replacement to full refurbishment to make your shoes look beautiful, we know what is takes to elegantly handle women's shoes. Guys, cold feet aren't necessarily a fear of commitment. Your shoes may just need attention. Remember, shoes "maketh the man". Let us help you stride out confidently. Your fashion accessories have to function well and look good, Not an easy task when busy, active lifestyles cause wear and tear. Need to think outside the shoebox? Talk to us about any specialised repairs, orthopaedic alterations, or sports shoe conversions. Check out our comprehensive range of quality leather and shoe care products. Use our staff's expertise to select the right products for your individual needs. Got a family member or flatmate always losing keys? We have a wide selection of the most common and can cut your's while you wait. WE WILL PRICE ALL YOUR CHALLENGING REPAIR JOBS, even if others have told you they are unrepairable. and we will send them back when they are repaired. We use quality materials sourced from manufacturers that adhere to international health and environmental regulations. and our shoe repair methods have been developed and refined over 80 years. We proudly back both our workmanship and materials. Your total satisfaction is our aim. If you do experience any problem as a result of our work or materials, we want to hear from you.